Solar switch flipped at Westbank and FNB Fairland campus. The switch has been flipped on a world-class solar panel installation at the WesBank and FNB Campus in Fairland, north of Johannesburg. Just 12 months after construction began on the large-scale renewable energy project, the 150 000 square metre Fairland Campus now supplements its electrical requirements using sunshine – helping the Bank reduce its carbon footprint by more than 2 700 tonnes per year, while lowering its dependency on the local power grid and passing the benefit to the community of Fairland. With more than 5 000 WesBank and FNB employees based at the Fairland Campus, shaded parking is at a premium. In 2015, a feasibility study was commissioned to establish the possibility of replacing ageing carports with solar panels. This thoughtful approach would provide more employees with covered parking and also benefit both the planet and local community by lowering carbon emissions and strain on the electrical grid. 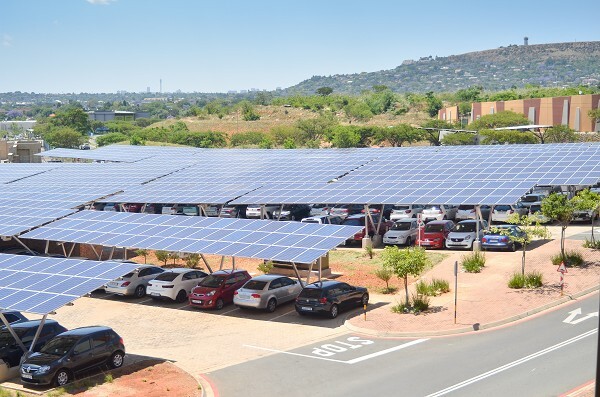 What started out as a parking lot with 978 dilapidated shade-cloth parking bays has been transformed into a futuristic field, with 7 647 reflective photovoltaic cells – across 1 010 parking bays – harvesting solar energy that helps power the Campus. Power from the solar panels is routed through 83 kilometres of DC cabling, where power is stored across 83 DC-to-AC inverters. At peak efficiency, the system is capable of generating 1.99 megaWatts – or enough to provide power to nearly 1 300 households. 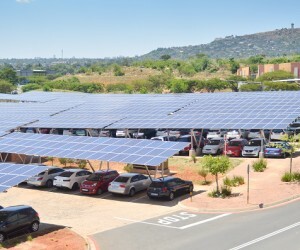 This solar panel installation is one of WesBank and FNB’s initiatives to earn a 5-Star rating for its Fairland Campus from the Green Building Council of South Africa (GBCSA). Environmental friendliness has always been part of the design of the building, which opened its doors in 2007. Existing measures to minimise the impact on the environment include population density sensors that power off lights when no human activity is detected; solar heating for the water circuits in ablution facilities; and sun screens on the exterior of the building, which provide insulation and improve the efficiency of heating and cooling systems.